Yes. Meatless. If you know us personally, or you’ve followed our blog for a while, you know this doesn’t sound like something we say very often. As much as we love fresh salads and vegetables, our main courses usually include some sort of protein. I must say though, that in this case, I really didn’t miss the meat or fish, at all! So what did we make that momentarily made us forget the meat, but not the grill? 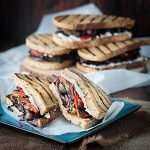 Today we’re sharing a very easy grilled veggie sandwich recipe with creamy goat cheese and roasted garlic. The vegetables and the bread were all grilled on our amazing new Broil King Baron™ S590 barbecue. 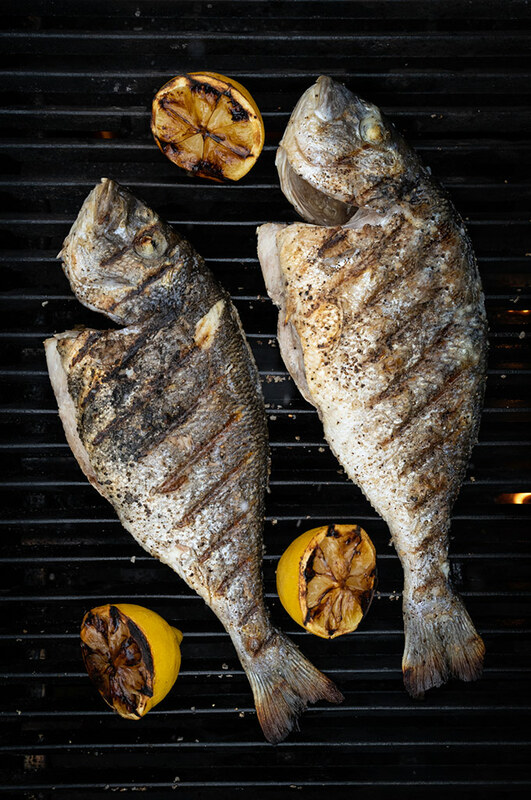 The consistent heat across the grates makes grilling all components for this dish extremely easy. We send a big shout-out and delicious thank you to our new partners at Broil King. This barbecue is next level! 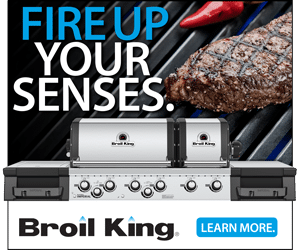 It’s no wonder the Broil King website opens up with the tagline, “The best grill you’ll ever own”. It really is the best grill we’ve ever owned! And we’re not just saying nice stuff because of our partnership. We honestly love this barbecue. We trust its quality, and we appreciate the great service we receive from Broil King. We say it like it is. Living in Canada, we sometimes have little choice but to buy our vegetables at the grocery store. However, whenever possible, when the season is right, we prefer to buy local, fresh veggies from farmer’s markets around us. It’s nice to actually smell fruits and vegetables the way mother nature intended them to smell. The scent of freshly picked fruits and veggies is just fantastic. It’s soooo different from the varieties we buy at the grocery store. Which reminds me… peaches are in season…. MUST grill me some peaches next! We have a few Farmer’s Markets nearby, but our absolute favourite is 19th Avenue Farmers Market. They’re not frilly or overpriced. What you find there is very fresh and local produce, along with fresh flowers, herbs, and other homemade goodies. Much of what they sell is grown on their own lands nearby or brought in from other local farmers. We love supporting local businesses, in particular those who work so hard to bring us nature’s bounties. So, it’s no surprise that all the vegetables we used in these sandwiches were from our local farmer’s market. Are these sandwiches difficult to make? Nope. These sandwiches were super easy. 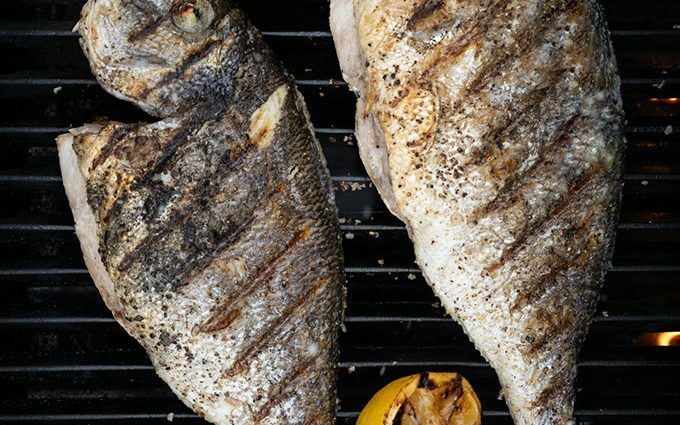 The trick is to have all your cut-ups done before you start grilling anything, and make sure the grill is nice and hot before you start. Also, another tip is to take the goat cheese out of the fridge about 30 minutes before you start grilling so that it’s soft and creamy and easy to spread on the grilled bread. Step aside meat (for today). We’re not vegetarians, but there’s nothing wrong with an occasional meatless meal. Go on, make your next meal a grilled, meatless one ,and eat well, friends! Not into vegetarian dishes? 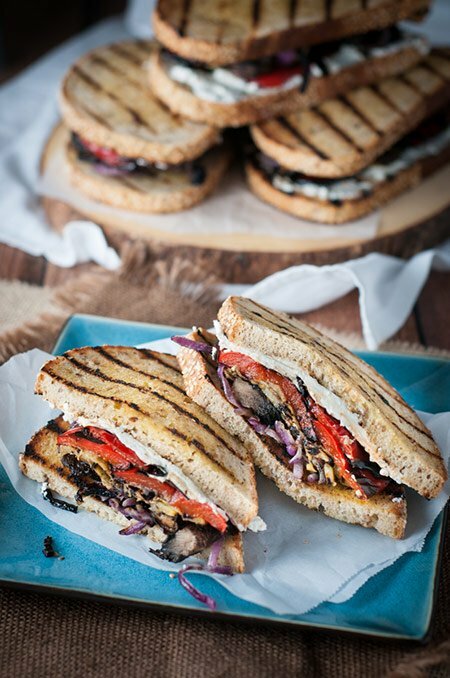 These grilled veggie sandwiches might change your mind! They're grilled, they're cheesy and they're garlicky... sooo good! Preheat the barbecue to between 450 and 500 ºF. Cut the top off the garlic head to expose the tops of the cloves. Place the garlic head on a large square of heavy-duty aluminum foil. Drizzle 1 tbsp of olive oil over the cut top of the garlic head. Sprinkle about 1/2 tsp salt over the head of garlic. Close all the sides of the aluminum foil up and over the garlic head into a nice little closed package. Twist the top tight. Place the garlic head package on the second rack to slowly roast the garlic while you cook the other veggies. Close the lid and mark down the time somewhere. You'll want the garlic to cook about 40 to 45 minutes. Cut your veggies as per the ingredient list instructions. Drizzle or brush olive oil over all the veggies (use about 3 tbsp of the olive oil for this step). Add a pinch of salt and black pepper to all the veggies (divide the remaining salt and pepper evenly between all the veggies). Once the garlic's been in the barbecue for about 25 minutes, place the peppers on the hot grill first and close the lid. After about 3 minutes, open the lid and turn over the peppers. Add all the remaining sliced veggies. Be extra careful with the red onion slices to keep the wheel slices intact. It's okay if they break apart a little. Close the lid. After about 3 minutes open the lid and turn all the veggies over. Close the lid. After another 3 minutes, open the lid and check for doneness. The veggies should be tender and have char marks. 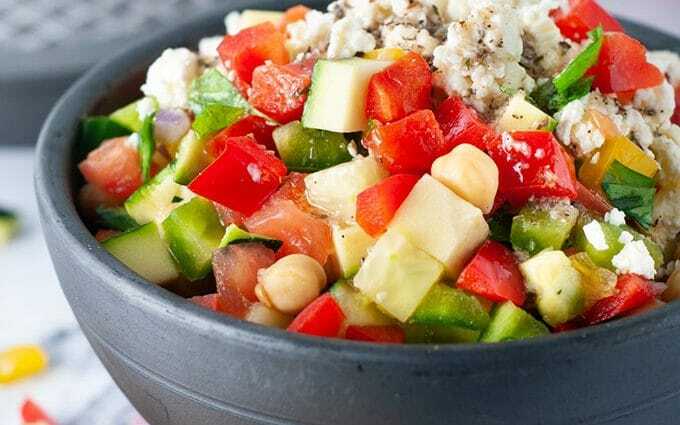 Remove all the vegetables onto a large serving dish, making sure to keep the different types of vegetables separate (to make it easier to assemble the sandwiches). You can let the onion fall apart completely now. The rings look great on the sandwich! Remove the garlic package and close the barbecue lid. Carefully open the aluminum foil package to expose the garlic head (it's hot). Once the garlic head cools a little and you can safely handle it with your hands, squeeze from the bottom to squeeze out the roasted garlic into a small bowl. Add about 3 tbsp of olive oil to the bowl with the roasted garlic. Use a fork to mash up the garlic and olive oil into an oily paste. Brush a bit of the oil and garlic onto all slices of bread, on both sides. Feel free to extend the olive oil if you start running out. Place the bread slices on the grill and grill them for about two minutes (or until you have char marks) with the lid open. Turn the slices over and grill for another two minutes. Assemble the sandwiches... place the first slice of bread on a plate. Add about 1/4 of each of the veggies onto the slice. Spread about 1/4 of the goat cheese on the bottom of the top slice, and place the top slice on the veggies. Repeat the last step for the remaining 3 sandwiches. You can use almost any favourite bread instead of the Bavarian Rye Bread. Just make sure the slices aren't too soft, so they can hold up the grilled veggies. Feel free to change up the veggies. 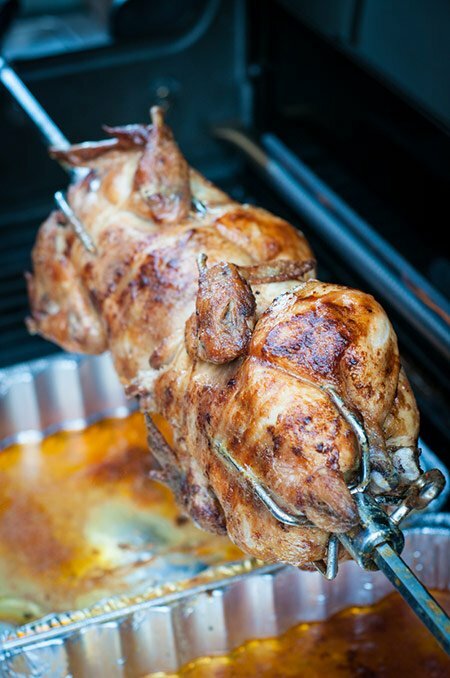 (Sponsored post) Portuguese folks know their rotisserie chicken (galinha de churrasco). But these Portuguese people (Nelson and I) used to have to go to Toronto to buy this deliciousness; an inconvenient venture unless we were already there for some other reason. Plus, unless we could eat it right away, it was never quite the same after reheating when we got home. Now, with our new family member, our gorgeous Broil King Baron barbecue, we’ve got all we need to achieve, at home, what we could not before. We are happy, happy, people! Nelson slathered the chickens, inside and out, with a thick buttery sauce mixture and stuffed it with a few lemon wedges just before sliding them onto the spit and sending them onto their rotating journey to golden awesomeness. Speaking of golden awesomeness, those drip pans beneath the chickens were there by design. Yes, they were there to catch drips and keep the barbecue clean. But more importantly, in terms of flavour, they were there to ensure we didn’t lose any of those liquid gold juices. Some of that is fat, of course, so we spooned out some of the oil and used the remaining ‘sauce’ to drizzle over our chicken (and bread) at dinner. Excuse me while I drool… again. Basting? 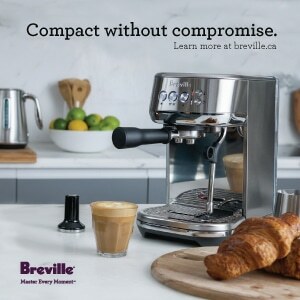 We don’t think you need to. You might be tempted to baste the chicken throughout the cooking, but we don’t think it’s necessary. While our Baron maintains its temperature very well, you inevitably increase the cooking time if you’re constantly opening the lid. Also, we don’t believe basting is required for this recipe. The chicken was so tender and juicy just with the initial slather – it didn’t need any more effort. Trust the magic. This barbecue does rotisserie right! It’s the real deal, baby! When you’re using the rotisserie, the heat source comes from the back of the barbecue rather than from the bottom. 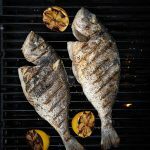 This ensures there are no flare-ups and it keeps a consistent heat across the entire spit–resulting in perfectly even cooking from end to end. …And it made us feel like a legit Portuguese Churrasqueira, right in our own backyard. 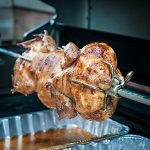 Portuguese rotisserie chicken – made at home – yes! Now we’re talking…and eating well, friends. Have you ever stopped at a Portuguese rotisserie chicken place? 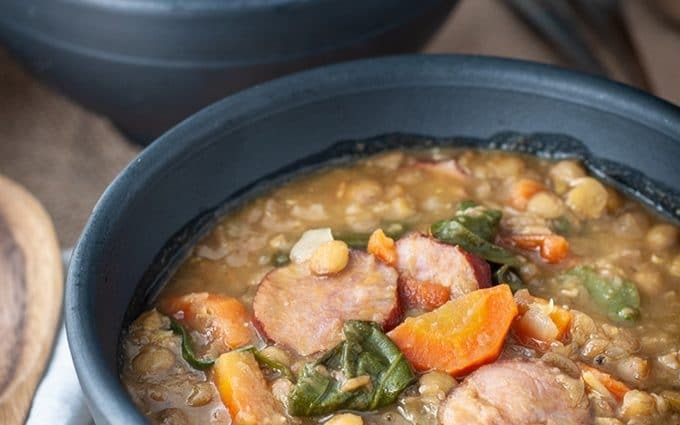 If you found it delicious, tender and juicy… you have to try this recipe! 1/2 cup unsalted butter, softened a little more than room temperature, but not to a liquid state. Remove the centre cooking grids from barbecue. Centre a drip pan (or pans) under the rotisserie, positioning it so it will be beneath the centre of the chickens. Turn on the barbecue's rear rotisserie burner and heat it to 400 ºF with the lid closed. In a bowl, mix together the butter, Frank's hot sauce, salt, pepper and garlic powder. With clean hands, slather a bit of the sauce mixture inside both chickens and add 3 lemon wedges to each chicken. Using kitchen twine, truss* (tie) both chickens tightly. Make sure the first spit fork is tightly secured. Position it so that once both chickens are on the spit, they're centred on the spit. Insert the first chicken through the spit, wing side opening first, until it reaches the spit fork, and carefully (watch the sharp ends) press it until the chicken is secured to the spit fork. Insert the second chicken through the spit until it's snug up against the first chicken. Insert the second spit fork on the spit, sharp ends toward the second chicken and push firmly until the second chicken is secure. Both chickens should sit on the spit tightly to avoid wobbling during cooking. Open the barbecue lid and fit the spit into the rotisserie motor end and then rest the other end of the spit on the opposite end of the barbecue. Follow your barbecue manufacturer's instructions for this step. Turn on the rotisserie motor, close the lid and cook at 400 ºF for about 1 hour and 30 minutes. The time may very depending on the size of the chickens. A thermometer inserted between the thigh and the breast should read 165 ºF. 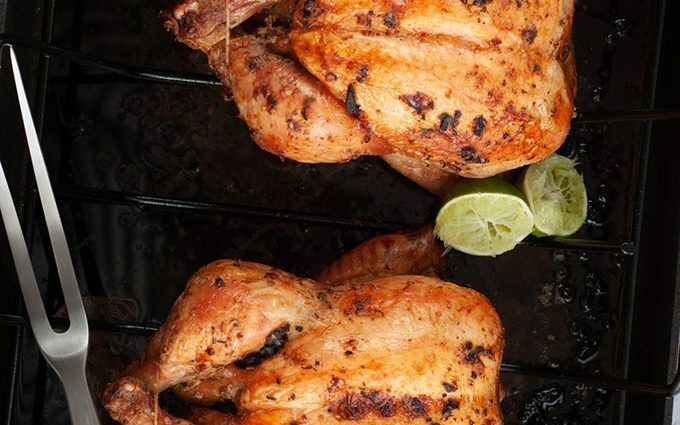 Slide both chickens onto a roasting pan to keep your food prep area clean. Cut the chickens into quarters or eighths and place the pieces on a serving dish with the cooked lemon wedges. Pour the juices from the drip pans into a bowl. Let the fat rise to the top and skim off some of the fat. 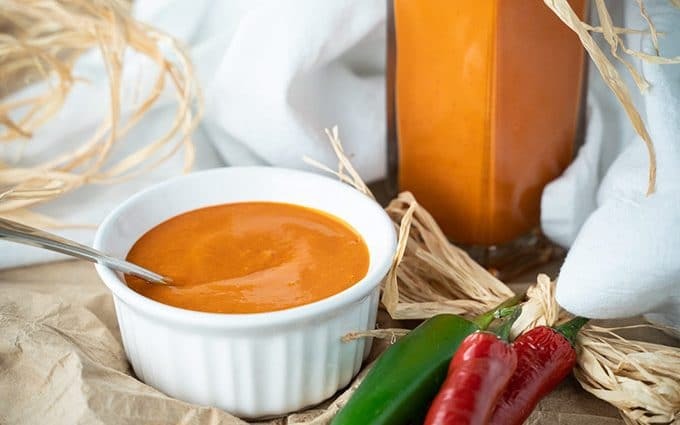 Serve these juices along side the chicken. Serve the chicken with roasted potatoes, fries, salad or any other favourite side. Enjoy! Feel free to cut the recipe in half if you're only preparing one chicken. *Jacques Pépin offers a great video on how to quickly and easily truss a chicken.